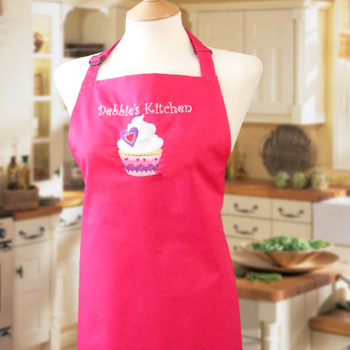 Mum will look a treat in our bespoke ladies cupcake apron. Mum will look a treat in our bespoke ladies cupcake apron. Hot pink chefs apron embroidered with decorative hearts cupcake in colourful threads and a name or title of your choice can be added in your choice of text thread colour too. Hot pink 72x86cm adult apron made from 65% cotton and 35% polyester and is fully machine washable with similar colours. Personalised gifts are custom made to order - usually within 2 working days.